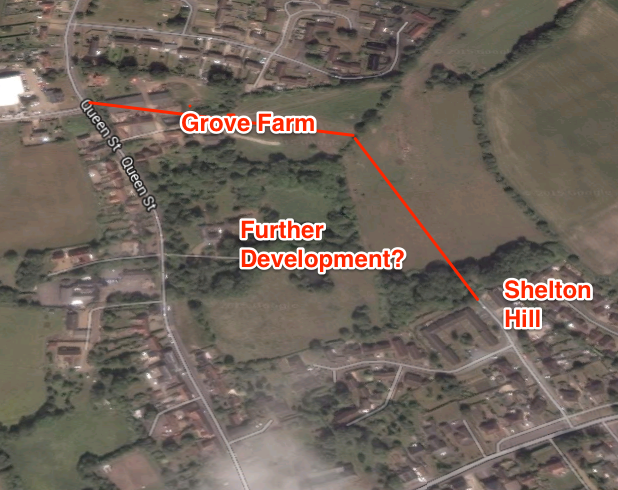 Papers published online as part of the Stradbroke Neighbourhood Plan traffic workstream show a suggestion to join together the proposed Grove Farm development with Shelton Hill in a bid to try and reduce traffic in the centre of the village. The paper shows an action on Cllr Stuart Crane, leader of the transport and traffic stream to discuss the idea with Cllr Olly Last as planning lead. Leaving aside the concept of the new road becoming some kind of a rat run to avoid a congested village centre, as the map shows, such a road would look even more likely to see the rest of the area south of Grove Farm developed with more housing. My view is this would change the character of Stradbroke for ever. The 54 houses proposed now could just be the tip of the iceberg. It is also sad to see the neighbourhood plan group reacting to the proposed Grove Farm development as if it was already agreed. It is true that the development may well go ahead but I think the plan should reflect what the village wants. Keeping the "shape" of Stradbroke as a village build on a staggered cross roads was something seen as important to large numbers of Stradbroke residents in the qualitative research undertaken for the neighbourhood plan. Lollipop person, rather than a crossing at Grove Farm development – we felt that a crossing would have the effect of backing traffic up through Queen St. – perhaps a lollipop person would be better, and would be better fitting in a village setting. This could perhaps be funded by the Section 106 money, or by the PC. Perhaps Trevor’s role could be extended? Whilst I quite agree that pelican crossings look like creeping urbanisation this idea does not seem thought through and stopping the over development should be the priority. That way we won't need any crossings. To me these kinds of discussions should be held at the full council as they are significant proposed changes. As things are now, as a councillor, the only way I find out about them is to search obscure links from the Council's preferred website. After the election I hope we can look again at the neighbourhood plan - an idea I pushed personally for some time - and ensure it is refocussed and the council involved in key decisions. I can find all manner of suggestions from the plan about education and traffic but nothing at all about the main thing a plan is about. Making planning policy. I know that is boring but at the end of the day that is all a neighbourhood plan can do.